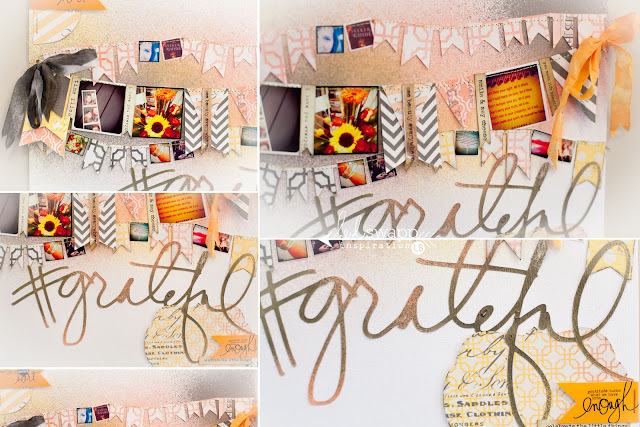 colorshine + heidi swapp + instagram + gratitude = 1 happy girl. this equation truly sums up how i feel about my newest media team challenge and my end result. i loved creating this layout for so many reasons, but most importantly it was just so fun to put together! my color fever challenge was to utilize a collection of very inspiring images as my base color palette and source of inspiration. from there i was to create a project that celebrated this color scheme. a big part of that color scheme was to only use 3 (yes...ONLY 3 which was incredibly hard since they are ALL amazing) colours of Heidi Swapp Colorshine on my project. I was only allowed to use the beautiful trio of Bronzer, Georgia Peach and Mustard. my wheels began turning and i was inspired to create this layout. with us now in the month of november, a time of festive fall and thanksgiving themes surrounds us. it is also the perfect time to reflect on the things that we love, adore and are so grateful for this time of year. with all those thoughts in mind i knew that this layout had to incorporate some of my favourite moments from this past year that really evoked a deep sense of gratitude from within me. immediately i reached for my file of instagram images and collected some of my favourites. i often find that my instagram images are the ones that capture my appreciation for my everyday. those candid moments that i want to celebrate and honour so they were the absolute perfect fit. i collected the ones that i wanted to use, and opened them in my home printer printing software. i have a canon printer at home and used the photo printing software that came with the printer. to make my instagram images teeny tiny, i simply uploaded them into the software and printed them on a 4 x 6 page using the index card option. depending on how many images i wanted on my index card, gave me the various size options. from there i simply printed and cut out with my trimmer. I began my layout with a 12 x 12 piece of Bazzill White Cardstock and randomly misted each of the 3 colors onto the background. I had no real plan here in mind. I just wanted to play. I love how the background came together and how perfect the Colorshine misted the paper. i then cut out some of the gorgeous Heidi Swapp Banner Delights with my Silhouette. I used the Color Magic paper and once I cut them out I misted them with Georgia Peach and Mustard Colorshine. once all of my pieces were cut out, colorshined and set up i mixed and matched my instagram images and banner delights to create a banner across my page. 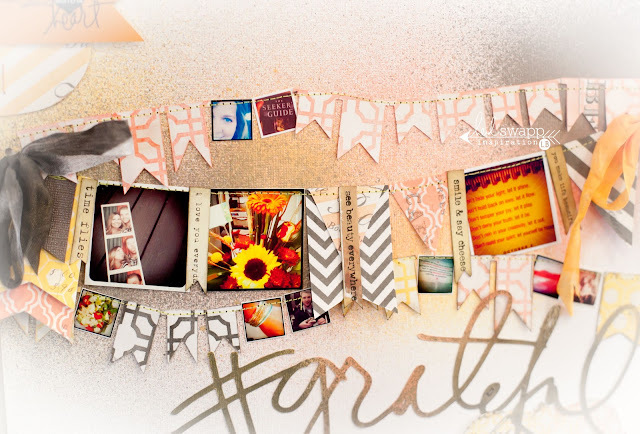 I layered pieces, mixed up random sizes and added a few of my photos into the banner. i love this technique and it is so easy to do when your photos are small. one of my favourite little details are the Heidi Swapp Sentiment Stickers added into my banner, but hung vertically. i just cannot get enough of those and want to use them in ANY way i can! after they were all adhered down i ran my sewing machine over the top and voila! my instagram/gratitude banner is complete! of course no layout would be complete without a customized silhouette cut Heidi Swapp title. 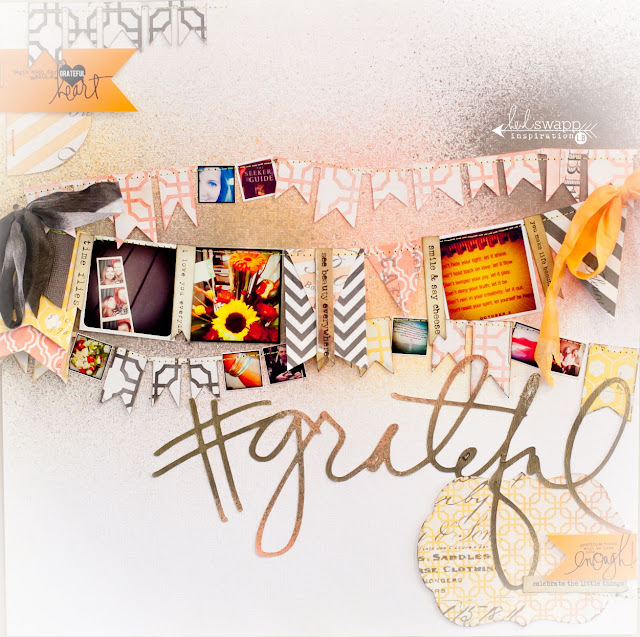 the #grateful title is from her digital gratitude kit and i cut it out using white cardstock and then used all 3 colors of Colorshine to take it one step further. i adore how the colors blended so well together. the little flags at the top and bottom of my page are also ones that i made by simply using the Heidi Swapp digital elements in photoshop and printing them on orange cardstock. i hand trimmed them and then stapled them to the corners. i hope you enjoyed my interpretation of the color fever challenge. it was a great way to stretch myself creatively, yet work within a set of guidelines that really helped me think "outside the box". i definitely challenge you to see what you can create by limiting yourself to colors, or supplies. it is a fun way to push yourself, try something new and of course....make pretty stuff! note: i LOVE instagram and i adore my followers! please come join my inspiration journey with me! my username is lbateman9442. see you on instagram! thanks for the inspiration... now to play! The mini's make this just plain Adorable and YOU are a color genius! GREAT inspiration, YOU rock!! Sigh this is just the most exquisite thing I have seen in a long time Lindsay, it stunning!